It's one thing I'm going to really miss when I go home. I have my favourite ones to go to but I thought I'd try this one in Dogenzaka. Funnily enough the place used to be a game arcade with a lot of UFO Catchers. Those days are all behind me. I haven't played in ages, touch wood. 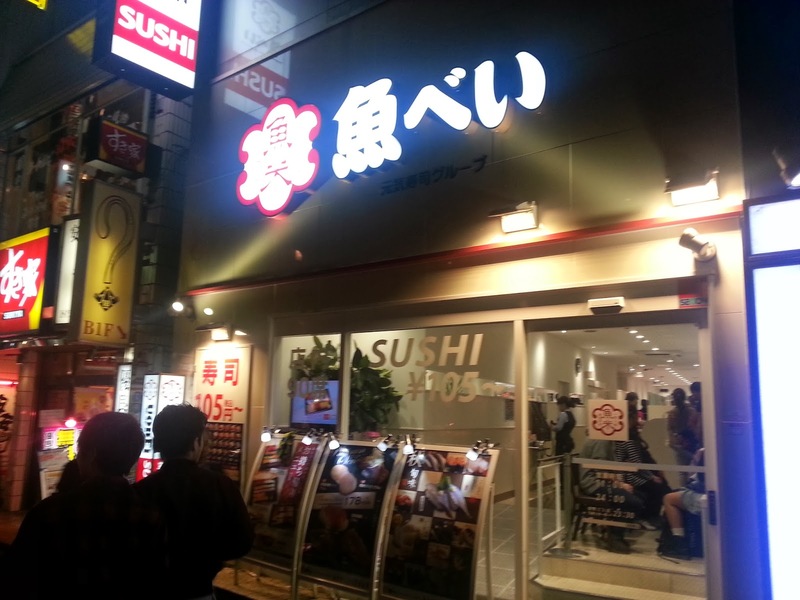 You can find this sushi bar here. This is actually the second time I've been here. The first time I was a little disorientated, but it's pretty simple to work everything out. After you've waited in a quick queue to you'll be handed a mini clipboard with a seating number (63 here). You'll find the seat number along the bottom of the monitor screen. Here you can see a brown box. That's the pickled ginger. It tastes great to eat between sushi bites. 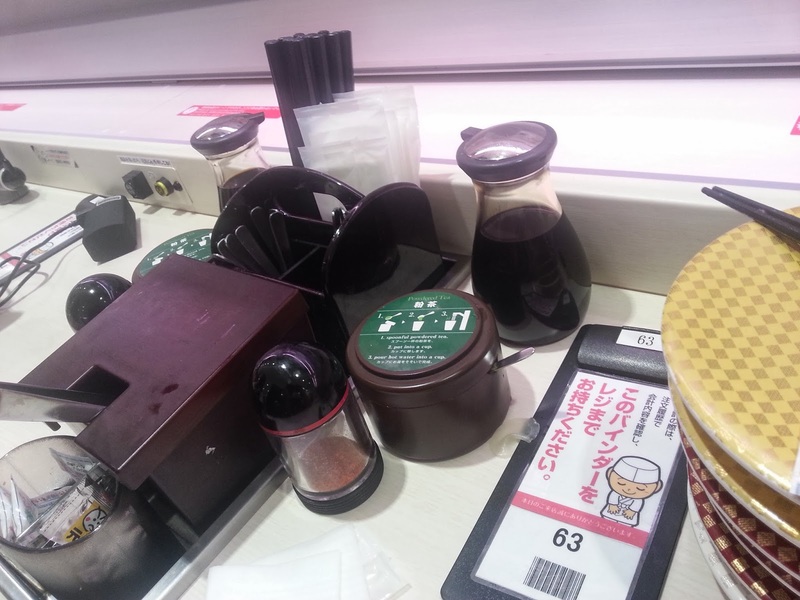 Also too is the green tea jar and soy sauce. First thing I was looking for was a cup for some green tea, and a soy dipping dish. They're up the top there to the left of the monitor! Ah, the monitor. If you're a bit shy to yell out "sumimasen!!" 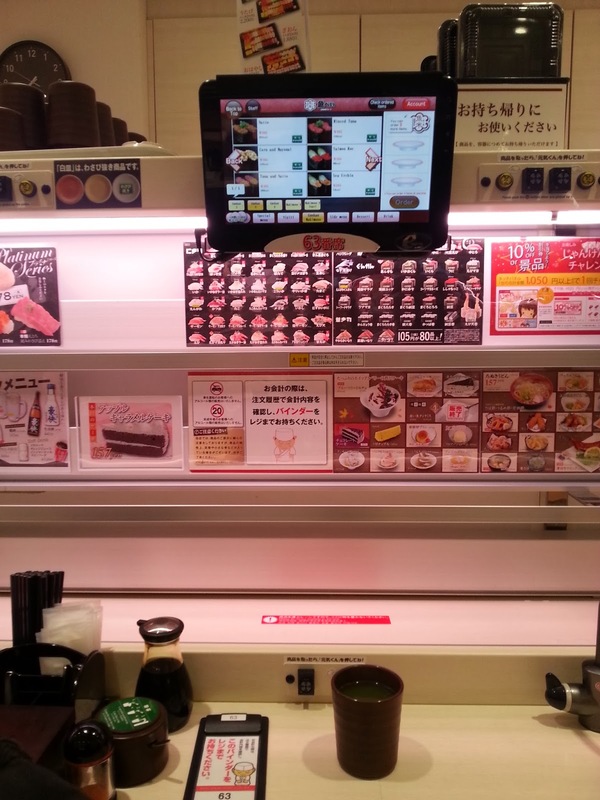 to get a sushi chefs attention, that little touch screen is a godsend. When I first came it wasn't working when I sat down, so they had to reboot it. Easy to use as it's got English too. The maximum order at once is three. Soon enough a tray will come zipping out with your order. Quickly take your plates and push the yellow blinking angry face button to send the tray back home. I thought the pieces were kind of small and the taste, while not bad, I can say I've had better. For 105 yen though you can't beat the price. There is recently another Genki Sushi just off Center Gai. For Shibuya I'd recommend Sushi Daidokoya, a short stroll here around the corner from the Dogenzaka place. It costs slightly more but seems a little bit bigger and tastier. Ask for the Avocado-maki. It's pretty special. 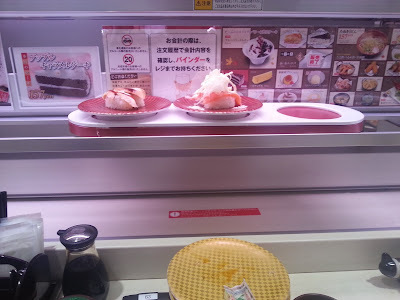 Only thing here, while they do have a conveyor belt, it's often better (and fresher) to get the chef's attention to make you a plate on the spot (yes, yell out "sumimasen!"). 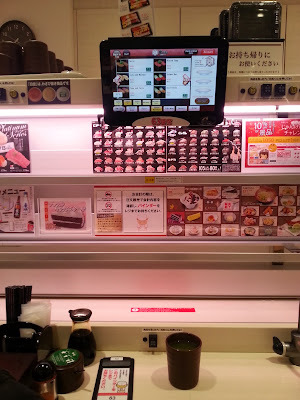 In Shinjuku I really like Ooedo Sushi. There are actually two very close to each other here (B and D on Google Maps. I like the B one better (It's to the left of the Taito game arcade). I've been here heaps of times. Cheap and cheerful, and satisfyingly filling.